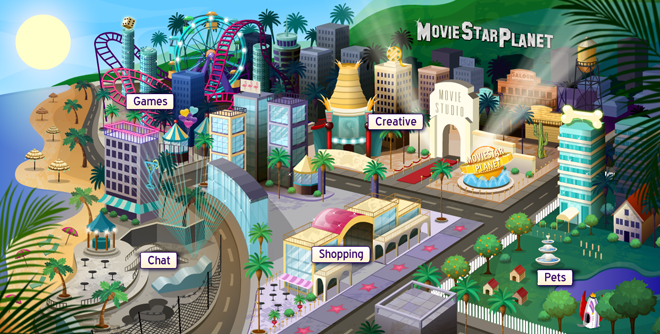 MovieStarPlanet is a fun and exciting place for children of all ages to play online in a safe and secureenvironment. The virtual world of movie star planet is much more than just a web-based game to play, movie star planet offers players the chance to live the life of a moviestar in both a fun and educational way which parents are teachers are sure to love. While signing up for your free account you'll be given the chance to create your very own avatar - this is your very own customizable movie star which you'll use when interacting with the virtual worlds of Moviestar planet. Upon entering the virtual worlds for the first time, you'll discover there's plenty to do and plenty of fun to be had. MovieStarPlanet is a social online game where you can make new friends, as well as invite your real life friends along to play and learn with. Create animated cartoons with your friends, go shopping, play games and earn virtual money, compete for fame by making popular movies - starring you and your friends, and unlock cool new features along the way, allowing you to future customize your movie star avatar! You can even get your very own pets! We love Movie Star Planet - and we know you will too! For further information about Movie Star Planet, check out our other sections about movie star planet guides, cheats, screenshots, VIP accounts, movies, pets, shoes, shopping and more!